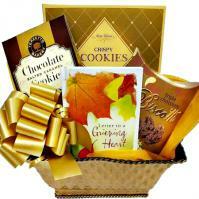 "I just wanted to write and tell you how quickly your customer care consultant acted on behalf of your company, Adorable Gift Baskets. After the death of my beloved sister I have had a very difficult time organizing my thoughts and taking care of the many thank yous that come with the death of a loved one. 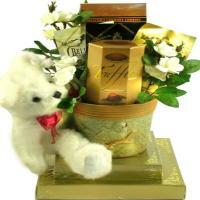 Your conscientious customer care has saved us such an incredible amount of hassle and trouble trying to get gifts out. Customer Service like this is what sets companies like yours apart and makes you stand out from the rest. So do your baskets which we think are superb. We are so impressed and grateful that we will sing your praises loud and clear to whomever we encounter. Thank you for a job well done. Sincerely Mary Dowling, New Fairfield, CT 06812"
Reach Out To Broken Hearted, Grieving Friends and Family Members. Comforting those who have lost a loved one isn't always easy. Reach out to your friends during times of grief. Let them know that your thoughts are with them. 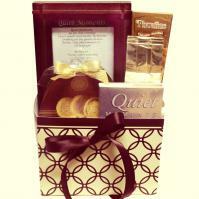 At times of bereavement beautifully packaged sympathy gifts are a wonderful way to convey your condolences and respect. 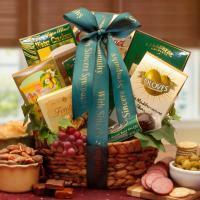 Send sympathy gift baskets, care packages and presents packed with gourmet foods, fresh fruits, coffee, tea, flowers and caring gifts of encouragement and inspiration. Anytime a person loses someone close to them it is a devastating event. When that loss is a member of the immediate family the devastation is intensified. When my husband died suddenly in a car accident, my entire world turned upside down. I knew deep down inside that I needed to be strong for my kids. On the outside, thatÌs how I appeared. But on the inside, I could feel myself slowly slipping away. When he died, a part of me did also. It was an enormous challenge just to get through each day. I sank into the depths of depression. I couldnÌt sleep at night. I wasnÌt eating properly and began to lose weight at an alarming rate. People were telling me how bad I looked. I withdrew into myself. In some ways, I became a hermit of sorts. I didnÌt even leave the house unless I absolutely had to. Nothing seemed to matter anymore. I cried and cried until I couldnÌt cry any longer. I felt completely drained as if IÌd become nothing more than a shell of the person I had been. I was lost and alone. While my husband was alive, I had never really realized how much he had actually done for me Ò how he had always been there to take care of me. I did what so many of us do. I took him for granted. I assumed that he would always be there to care for me. I didnÌt realize how dependent on him I had become. For the first time in my life I felt completely alone and it frightened me terribly. Over the course of months, the depression worsened. I became forgetful; I couldnÌt seem to concentrate. I had no ambition or drive. My inner strength had dissipated. I had no idea how I could go on with my life; I wasnÌt even sure if I wanted to. Then one night as I sat crying alone in the dark after the kids had gone to sleep and the house was quiet, I realized that my husband wouldnÌt want me to react in this manner. He would want me to go on and do the best I could do. Right then and there, I knew that I had to pull myself out of my depression. I started to channel my grief into my writing. I poured out my emotions on paper and wrote a book of poetry that I dedicated to my husband. Soon after that, I decided to try my hand at fiction and wrote a book based on a dream I had about death and the afterlife. I learned to channel my pain and anguish into a positive endeavor. It didnÌt matter whether those endeavors were financially successful or not; they were successful in their purpose and that purpose was for me to heal. It was necessary in the respect that I felt like I had to do something for my husband and I needed to release my emotions. I did that the best way I knew how. I wrote to honor my husband and to comfort myself. It has been a long, hard climb out of depression but gradually IÌve been able to move forward. Grief can take its toll mentally, physically and emotionally. Recovery can take a long time. I honestly believe that we never fully recover from the loss of a loved one. We must remember that those weÌve lost would want the best for us. They would not want us to make ourselves sick or to withdraw from life. They would not want us to grieve ourselves into a state of depression. Of course, we know this but it is not always so easy to get on with life. After the loss of a loved one, our emotions are in a state of confusion. We donÌt understand why such a tragedy happened to our loved one. We may be filled with anger at the one who passed for leaving us alone. We may be angry with ourselves for not doing something to prevent the tragedy. We feel that we let them down because we did not protect them well enough or could not save them. The flood of emotions are bound to be overwhelming. Once those emotions no longer serve us, we have to let go. Letting go can be the most difficult thing in the world to do but we must gradually come to terms with the futility of those emotions. No amount of grief can ever replace those weÌve lost. As difficult as it is, we must accept the fact that death is a natural part of the life cycle. Our lives in the flesh are finite. Dealing with the loss of a loved one is always devastating regardless of the circumstances but in the back of our minds we do somewhat prepare ourselves when we have a loved one who is elderly or one who suffers from a progressively detrimental illness. You can never really be prepared to lose those you care for but you are more aware of the possibility with the aged or ill. Rarely do we think of the possibility that death could strike the young or seemingly healthy. In such instances, loss is even more difficult to accept. Those left behind often feel as though they are in a dream state. Conscious reality feels anything but real. Each individual grieves in different ways and for various lengths of time. Whether we realize it or not, the grieving process is a natural and healthy way of dealing with loss. Whenever a major change takes place in oneÌs life, it always takes time to adjust. Allow yourself the necessary time to grieve. Everyone needs a period of adjustment to adapt to the altered circumstances fate has placed before them. But donÌt allow your grief to turn into severe depression. Honor the memory of those lost by attempting to bear positive fruit in the best way you can. Write, paint, take a class, dedicate a memorial plaque in your loved oneÌs name to a local organization, volunteer at a local hospital, nursing home or child care program. There are numerous ways that you can help others and by doing so, you will heal. You will always miss those you lost but donÌt lose yourself to depression and despair. There is always someone else who needs you even if you donÌt notice him or her at first. Make a difference in the life of someone else who is hurting and youÌll soon find your own wounds have healed.